There are ominous parallels between “The Last Man in Europe” (published as “1984”) and “Homage to Catalonia,” which recounted Orwell’s struggles as a militiaman in the Marxist Unification Workers’ Party militia fighting christian fascism (El caudillo de Dios) in Spain. Back before there was any such thing as an aggression-rejecting Libertarian Party, intellectuals had to side with either International or National Socialism. There was no way out of that universe-of-discourse dilemma. 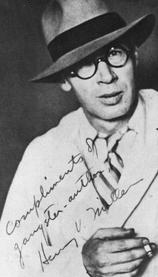 Writer Henry Miller was one of the rare famous libertarians rejecting the entire false dichotomy, to Orwell’s shock and dismay. Ayn Rand’s “We the Living“ and “Anthem” and were published in 1936 and 1938, but Orwell managed to ignore her somehow. 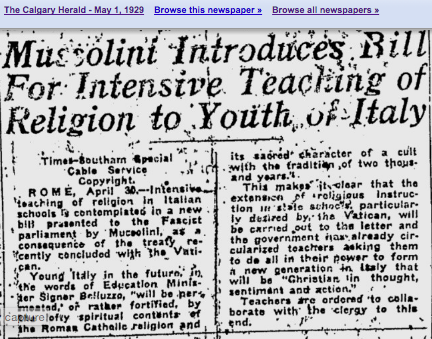 Mussolini signed a treaty with the Pope to bring religious indoctrination into government school classrooms. 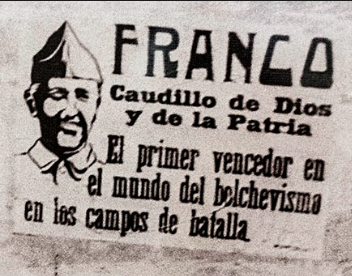 Franco’s own posters described him as el “Caudillo de Dios,” saluted by the kiddies, and Adolf Hitler–painter of churches, Jesus and Madonnas–passed up no opportunity to exploit Christian altruism as a vehicle for demonizing “selfishness,” meaning all things Jewish and/or laissez-faire (meaning liberal). During the Spanish revolution, Orwell reported, a sign of anti-religious “leftist” sentiment was the chiseling of religious symbols off of gravestones at the local graveyard. 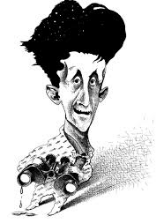 Yet Orwell shied from openly mentioning religiosity as the crucial difference in the late thirties or early forties. By the 1970s, fans of Robert Heinlein and Ayn Rand were forming the Libertarian Party as an alternative to linear, anti-life ideologies so popular among Europeans. The first Libertarian platform included a plank the Supreme Court copied as its Roe v Wade decision striking down ku klux Comstock laws. Soon politics changed from a one-dementional line to a two-dimensional plane representing the four states available where there are two separate binary switches. This has happened in Germany, Austria, Italy, Rumania, Russia and its satellites, Japan, China, Burma, India, Vietnam, Cambodia, Brazil, Chile, Argentina, Peru, Venezuela and Ecuador, all mohammedan countries and most African nations at one time or another. All of them started by assuming freedom could be “cut” with just the right amount of coercive aggression, then increased that amount until totalitarian rule became established. Observe that ALL totalitarians criticize as “anarchic” anything that offers more freedom than their armed goons have orders to tolerate. The best hedge against the abyss of totalitarianism is a functioning Libertarian Party. Should the need arise for legal, contractual or historic translation Orwellian in its attention to detail, drop us a line or visit Speakwrite.